Crews are still working in Plains, Kismet, Minneola, Fowler, Liberal and Engelwood. Total outages at this time are 209. In addition to the Southern Pioneer crews, there are eight linemen from J&J Powerline and six linemen from Pioneer assisting. Many consumers in these areas have experienced damage to their consumer owned equipment and are waiting for assistance from electricians, some of which may take days. Safety messages continue altering consumers to the dangers of downed power lines. TCEC Update Wednesday January 18. RESTORATION UPDATE – WEDNESDAY, JAN. 18, 9 A.M.
As of 9 a.m. Wednesday, January 18, power has been restored to all the affected towns in our service territory, with the exception of the Balko and Elmwood communities. Unless you are waiting on an electrician or are in Balko or Elmwood, you should have power if you are within the city limits of a town. If not, please call 580.652.2418. If you were required to call an electrician, please call us once they have made repairs. Outage duration in rural areas will vary and is unknown at this time. Some outages could last weeks due to extensive ice damage. The Ministerial Alliance of Beaver has an emergency shelter set up at the Church of Christ. It is serving hot meals at 8 a.m., noon and 6 p.m. through Sunday. Contact Reverend Jim Reeves at 806.330.2267 for more information. Remember to stay away from power lines on the ground or touching trees. If you have reported damage, we are aware of it and are working toward fixing it. If you use a portable generator, isolate it from our lines. Generators that are not isolated can feed back into our electrical system and possibly electrocute anyone coming in contact with those wires. If you don’t have a double throw transfer switch installed by a qualified electrician, plug appliances directly into the generator using a properly sized extension cord. Notify TCEC of any generators in use that are not isolated so we can note your account. Due to the ongoing restoration, we are not performing generator inspections. To track the progress of outage restoration efforts, see the outage map at tcec.coop. Follow us on Facebook for restoration photos and regular updates. As of 9 a.m. Tuesday, January 17, TCEC has brought in an additional 150 linemen who are working extended hours to restore power to members affected by the ice storm. At this time, approximately 4,350 meters in Beaver County and parts of Texas County are without power. We are estimating more than 1,000 broken poles and more than 1,400 damaged crossarms. We are setting poles and stringing wire today. Because of the wet and muddy conditions, progress will be slow. There are many downed power lines lying across roads and driveways. Our restoration efforts are focused on critical infrastructure (substations, transmission lines, main distribution lines, etc.). Do not touch any wire on the ground, even if you think it is phone or cable TV. Any line, no matter what type, has the potential to become energized due to storm damage. Do not try to remove wires that are tangled in trees. We are not able to give estimates of when crews will be in your area to take care of downed lines but we do appreciate you reporting them. Be careful with generators. Improperly connected generators create dangerous situations in your home or business. An improperly connected generator can energize power lines and electrocute linemen or anyone else who comes in contact with the line. If you have not yet reported your outage, you can do so using SmartHub or by calling 580.652.2418. Once reported, though, calling back for status reports unnecessarily ties up phone lines and resources needed to get lights back on. Outage duration will vary and is unknown at this time. Some outages could last weeks due to extensive ice damage. To track the progress of outage restoration efforts, see the outage map at tcec.coop. As of 6 p.m. on Monday, January 16, we have 32 crews and more than 150 lineworkers working extended hours to restore power to members affected by the ice storm. At this time, approximately 5,719 meters in Beaver County and parts of Texas County are without power. We are estimating more than 1,000 broken poles at this time. Because damage is still occurring, we are staging, framing and working on transmission lines. We will start setting poles and stringing wire after the damage is complete. Because of the wet and muddy conditions, progress will be slow. If you are without power as of 6 p.m. on Monday, please make plans for an extended power outage which could last weeks due to extensive damage. We are following a restoration plan, which allows us to work in the most efficient manner. Trunk lines, the backbone of our system, are repaired first. Next, attention is turned to taps and feeders off those main lines. Most of the wires you see are taps and feeders, not main circuits. Last, we concentrate on individual service wires. We decide which repairs to make first according to the number of people the repair affects. We appreciate your patience and ask that you avoid approaching crews as this is unsafe and hampers restoration efforts. Please use the SmartHub app to report power outages if possible. Phone lines may be crowded due to the number of members affected. To report an outage or speak to a representative, call TCEC at 580.652.2418. We are currently receiving notifications of outages across our service territory. The communities of Pratt, Haviland, Liberal, Minneola, Sun City and Coats are currently experiencing outages as ice accumulated on lines begins to melt. As ice melts, it releases tension stored in the neutral line causing it to make contact with the live phase. We are thankful the wind has stayed to a minimum during the melting process which has limited the potential number of outages. Total meters, including Pioneer and Southern Pioneer, without power are 1,878 with the majority of that total being in the communities listed above. Crews remain diligent in many communities removing tree limbs and debris from lines to restore power to homes and businesses. Early morning total of 1290 total meters off total across Liberal, Fowler, Mineola and Englewood. Currently, the total of 1290 has been reduced to approximately 500 meters still off. Mainly tree issues and limbs on lines causing outages. Additional J&J Crews are at work in Liberal area. No significant outages to report this morning. Crews are working on tree clean up and receiving calls of limbs on lines. Monday morning – January 16, 2017, 9 a.m. Outage duration will vary and is unknown at this time. Some outages could last a week or more due to the possibility of additional system damage today. As of 9 a.m. on Monday, January 16, we have 16 crews working to restore power to members affected by the ice storm. More crews are on the way. At this time, approximately 6,200 meters in Beaver County and parts of Texas County are without power. Because damage is still occurring, we are staging, framing and working on transmission lines. We will start setting poles and stringing wire after the damage is complete. Because of the wet and muddy conditions, progress will be slow. If you remain without power in Beaver County, please make plans for an extended power outage which could last a week or more due to extensive ice damage. Please use the SmartHub app to report power outages if possible. Phone lines may be crowded due to the number of members affected. To report an outage or speak to a member service representative, call TCEC at 580.652.2418. As of 9 a.m. Monday, if you remain without power in Beaver County, please make plans for an extended power outage which could last a week or more due to extensive ice damage. Please do not approach our crews as this is unsafe and hampers restoration efforts. Full update at https://www.tcec.coop/node/276. Damage assessment continues as we expect additional damage to occur. More than 200 poles snapped so far. We currently have just over 1,000 outages in Liberal, Fowler, Minneola and Englewood. We are bringing in additional crews to help with Winter Storm Jupiter restoration. There is a considerable amount of ice buildup on the lines, so we are hoping for a little warmer weather before the wind begins to blow. Please stay home if you can, do not attempt to move power lines and keep children away from sagging tree limbs. To report outages, please call 866-668-8800. Significant tree limb damage in Liberal this afternoon with upwards of 950 consumers without power a few hours ago. Currently, 170 meters are still without power and one pole down. Some consumers will require an electrician as our linemen can only repair the utility owned equipment and some consumer owned equipment has been torn down due to tree limbs falling. Additional J&J Powerline crews will assist in Liberal tomorrow. Winter storm Jupiter has swept into the Oklahoma Panhandle, causing power outages for many TCEC members in Beaver County and elsewhere. Efforts continue this afternoon to restore electric service to about 2,000 TCEC meters affected by the ice storm. As always with an ice event, the extent of the damage will depend on the wind. The current wind forecast is calling for an increase this evening. TCEC has all hands plus six additional contract and mutual aid crews working extended hours to restore power to affected members. Four more crews are slated to arrive tomorrow morning. One area of major emphasis during restoration efforts will include replacing broken poles. So far, about 100 of more than 100,000 poles on the TCEC system have snapped. 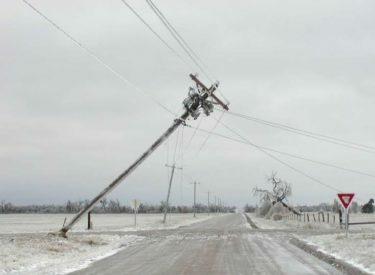 Almost all power problems were caused by ice-coated trees breaking and falling across power lines. Members still without power who have not yet reported it should contact TCEC at 580.652.2418 or using the SmartHub system. Once reported, though, calling back for status reports unnecessarily ties up phone lines and resources needed to get lights back on. Remember to stay clear of any downed line, no matter what its location or appearance. Coldwater | Power has been restored to the town of Coldwater. There are less that 10 consumers that remain without power. The crews are working hard to restore power – thank you for your patience. Liberal | Power has been restored to the southern part of Liberal. Our line crews are working as quickly and safely as possible to get power restored to the last few. Liberal has 53 outages, most due to trees on service wires. Pioneer Electric is sending 4 men and 2 small buckets from Ulysses to help out. No feeder or wide spread outages at this time. Medicine Lodge has isolated outages and all their linemen are currently out. They have the most ice with 1/2″ and foot long ice sickles hanging off. Wind is calm. The town of Coldwater is without power due to a junction pole being lost due to ice. Pioneer Electric is also reporting a few outages due to ice on trees. Crews are out working to restore the power to the affected areas. If you are experiencing an outage, please notfy your utility company.